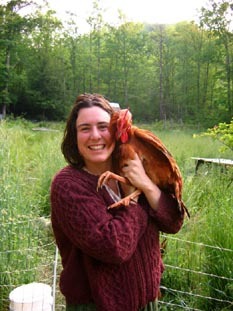 Earthaven members engage in agricultural endeavors on many scales, from home gardens, to neighborhood gardens, to farms. Farmers and gardeners experiment with a wide variety of crops, animal husbandry, and growing techniques. From the time that the founders decided to settle at Earthaven,as a forested piece of land, they knew that much clearing would need to happen for agriculture. Members have been building and heating homes with the wood from the agricultural clearings for many years. We intend to use agriculture to provide sustenance and livelihood for ourselves, through a regenerative relationship with Earth, peaceful trade with our neighbors, and demonstration of our values. Our agriculture will enhance, rather than diminish the fertility of the soil and the biodiversity of our ecosystem. As Earthaven member Chris Farmer says, “May we bring the consequences of our lives within the horizons of our lived experience.” Only then will we sense in common our connection to the source of our lives. 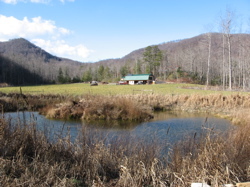 Gateway Farm comprises five beautiful acres of bottomland adjacent to the Earthaven gate. The farm is a growing demonstration of integrated agriculture, incorporating pasture-raised sheep and poultry, annual and perennial plants, forestry, and biofuel production. Imani Farm is a 4+ acre pasture-based, homestead farm in the center of our village. It is adjacent to and operated by the residents of Village Terraces Cohousing Neighborhood. Imani’s production plan is centered on raising dairy cows and laying hens as well as perennial orchards and seasonal annual cultivation, all organically. The Peace Garden, a work in progress begun in the winter of 2007, is situated at the heart of the community, yet in a secluded area where bamboo grows and two creeks converge. It is easy to find, directly across from the Visitor Kiosk and in front of the 2nd bridge. The intent of the garden is to create a place of quiet refuge in the midst of the marvelous but intense activity of our village. All are welcome at any time. 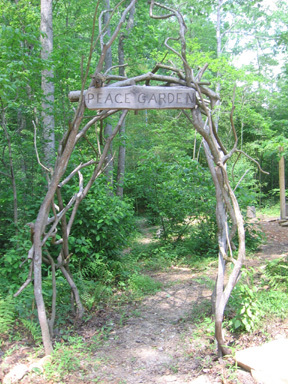 It has a peace pole, pathways, benches, fruit trees, and a living fence to separate it from a parking lot. Sue and Geoffrey Stone’s hand-built Earthship (house made of recycled tires) boasts a beautiful Home Garden. 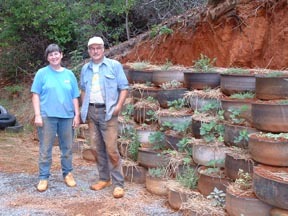 The artist/builders are pictured here in front of their retaining wall garden of hanging plants such strawberries and herbs, also made from recycled tires. 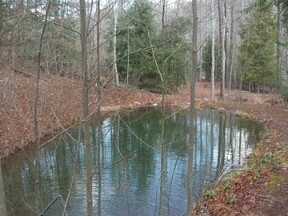 The Trout Pond is located across from the hydro-power station and is stocked with hundreds of trout. We thoroughly enjoy fishing for and eating these beauties when they grow to full size. Useful Plants Nursery is a small, permaculture-based nursery selling to a retail market, specializing in useful, phytonutritional food and medicine plants well-adapted to our southern Appalachian mountains and surrounding bioregions. The Village Terraces Neighborhood Gardens are located on the south side of our buildings, so it’s hard to see it from the road. Here’s a look at the beauty and bounty that a cooperative group can produce. Julie and Andy run Yellowroot Farm from their farm base in the Hut Hamlet. We are part of a collective of local farmers called Foothills Family Farms, where we market some of our pork and vegetables. The greenhouse at the forest garden is one of the first buildings found inside the gates of Earthaven, just past the bank of mailboxes. 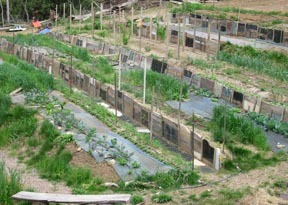 The forest garden is an example of a style of gardening that mimics nature while emphasizing production of food, fiber, fuel, and other useful products. In addition to the practice of forest gardening, this permaculture-based garden hosts a variety of courses in which people can explore diverse concepts and skills needed to build a sustainable culture.